To place a library book on reserve, please check Faculty Info. Make arrangements directly with these departments and inform students that items must be used at their respective locations. For items that are not in the library's collection and require ordering, please supply as much information as possible (publisher, distributor, address/telephone, year, ISBN #, etc). Please allow at least two months for the ordered items to be put on reserve. Only one copy can be purchased due to limited funds. Fill out a Print/Electronic Reserve Instructions and Form. Please read the Copyright Info page before signing or typing your name. An email will be sent to the address provided when the materials go on reserve. 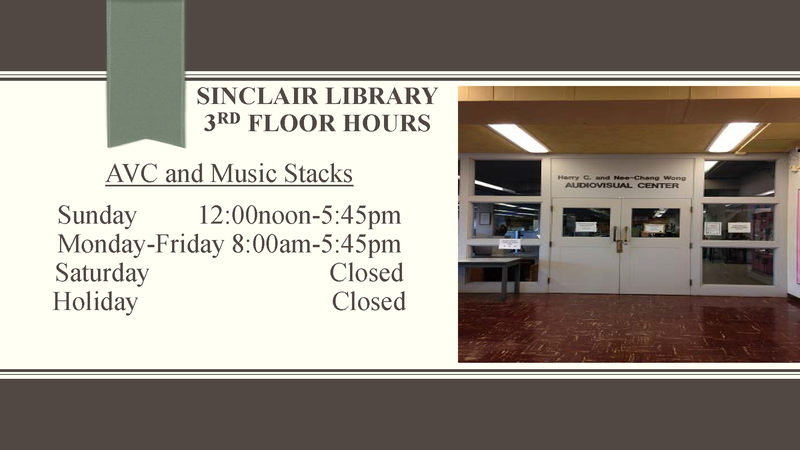 Submit the completed form to Sinclair Library. We will check the requested materials to see if they are available electronically. If they are we will make a link to it. If not we will check to see if the material falls within copyright. If it is copyright compliant, we will scan the allotted amount and place it on electronic reserve. If it is not we will notify the faculty with the reason and try to work something out. All electronic reserve materials will be taken down at the end of the semester. If you have a photocopied version of the text you like to put on electronic reserve then please be sure to provide the 'Title Page' and the 'Copyright Page' along with the text.